From the author of Is That Your Mother-In-Law under the Bed? and Is That Your Cousin in the Closet? and Is That Your Neighbor in the Basement? 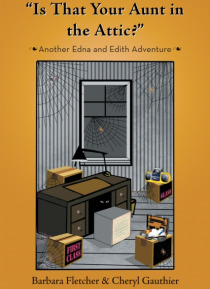 comes the fourth book in the series featuring Edna and Edith as mischievous senior citizen sleuths. This book was coauthored by Barbara Oliver Fletcher and her daughter Cheryl Nicoll Gauthier. Luis Gdulinski, an escaped convicted killer wants Edna and Edith… dead! The sisters have already witnessed what Gdulinkis hit men are capable of, so theyve decided to get the hell out of Dodge and head for San Francisco to visit Ediths daughter, Elaine. During their stay, they stumble on some suspicious activity a few doors down from Elaines house. This prompts the sisters to leap into action and, in some cases, leap behind boxes or bushes as they try to uncover the nocturnal activity. After returning home, Edna and Edith are immediately hired to investigate Trent Holcombs soon-to-be fiance, Lydia Sizemore. Undercover work on the high seas takes an unexpected turn as the sisters use their dubious detective skills to learn more about the shifty men in the cabin next door as well as Lydia and the secret shes concealing. As they navigate through their adventures, the sisters continue to find themselves in precarious and hilarious situations while struggling to avoid Gdulinskis assassins, who are trying to collect the massive bounty on their heads.